Choose size: 4 Currently out of stock. 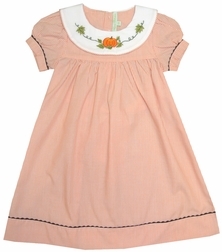 A lovely light orange small stripe fabric dress with a big white portrait collar hand embroidered with a pretty orange pumpkin and green vinery. 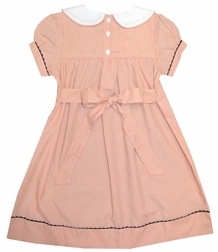 The sleeves and bottom of the dress are trimmed with brown ric rac and the dress has sashes that tie in the back to form a big fluffy bow.